Since the opening of the Estoril Golf Course in 1936, a number of alterations and improvements have been made to its original layout. Overlooking Estoril and the sea, the 5262 meter long course is set amongst eucalyptus, pine and mimosa trees, giving it a uniquely colourful touch. 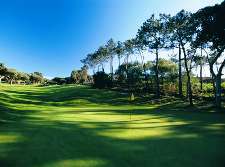 The architect and the successive green keepers have made excellent use of these various trees which, together with the uneven terrain, make the Estoril Golf Course challenging in terms of accuracy rather than distance. The Estoril Golf Course demands excellent tactics. The visually stunning par 3 holes, although they vary in length, all pose particular challenges. I ts hole number 16 is internationally well known, a Par 3 of 184 meters. Two of the most important tournaments in the Portuguese golfing calendar have been held frequently at the Estoril Championship Golf Course: the Portuguese Open 20 times and the International Amateur Championship 62 times. The long list of famous golfers who have played Estoril includes S. Ballesteros, Colin Montgomerie, Sam Torrance, José M. Canizares, Gene Sarazen, Peter Allis and Bernhard Gallacher. 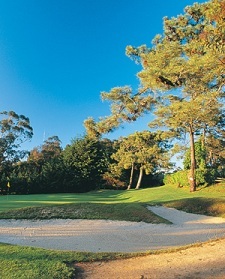 Twenty years, after its opening, the management team decided to complete the Estoril championship golf course with a 9-hole course. The idea was to create an excellent 9-hole course in the same wonderfull surrondings. 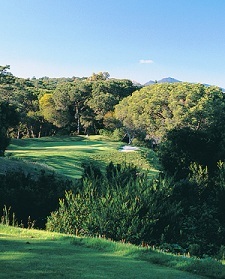 The Estoril Blue Course provides the perfect location for less experienced players to develop their skills and for those who want to practise but do not have 5 hours. The caddies at the Estoril Golf Course are among the most experienced - some of them have worked for many PGA players while competing in Portugal. Estoril is the only course in Portugal to propose the service of caddies, always available to advise on the most difficult shots and reveal some of the course secrets. For more information about Estoril Golf Club and Greenfee bookings, please click here! Find here a list of all golf courses in the Lisbon area.